"Blessed is the man who trusts in the LORD"
Man, tempted by the devil, let his trust in his Creator die in his heart and, abusing his freedom, disobeyed God's command. This is what man's first sin consisted of. All subsequent sin would be disobedience toward God and lack of trust in his goodness. 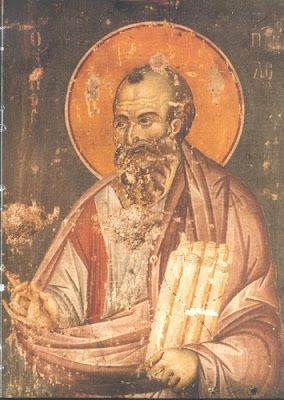 S Polycarp, bishop and martyr: "Wisdom"
He who holds her fast inherits glory. Feast of the Chair of Saint Peter, Apostle: "“You are the Christ"
you are Peter, and upon this rock I will build my Church, and the gates of the netherworld shall not prevail against it. The Lord made Simon alone, whom he named Peter, the "rock" of his Church. 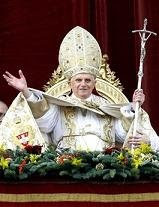 He gave him the keys of his Church and instituted him shepherd of the whole flock. "The office of binding and loosing which was given to Peter was also assigned to the college of apostles united to its head." This pastoral office of Peter and the other apostles belongs to the Church's very foundation and is continued by the bishops under the primacy of the Pope. Christian petition is centered on the desire and search for the Kingdom to come, in keeping with the teaching of Christ. There is a hierarchy in these petitions: we pray first for the Kingdom, then for what is necessary to welcome it and cooperate with its coming. This collaboration with the mission of Christ and the Holy Spirit, which is now that of the Church, is the object of the prayer of the apostolic community. It is the prayer of Paul, the apostle par excellence, which reveals to us how the divine solicitude for all the churches ought to inspire Christian prayer. By prayer every baptized person works for the coming of the Kingdom. "So shall my word be"
The fruits of charity are joy, peace, and mercy; charity demands beneficence and fraternal correction; it is benevolence; it fosters reciprocity and remains disinterested and generous; it is friendship and communion: Love is itself the fulfillment of all our works. There is the goal; that is why we run: we run toward it, and once we reach it, in it we shall find rest. 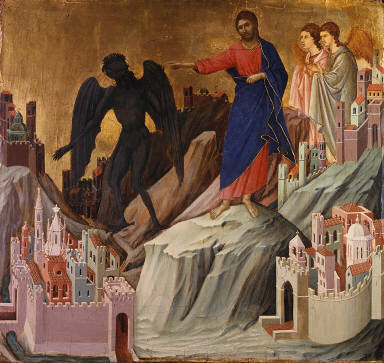 First Sunday of Lent: "Filled with the Holy Spirit, Jesus returned from the Jordan and was led by the Spirit into the desert for forty days, to be tempted by the devil"
to be tempted by the devil." We are so often tempted by the devil as we read Jesus was in the Gospel today. We experience "deserts" when we feel alone before the world and helpless in temptation. But this is because we so often try to do so only under our own resources. We have to learn what Jesus teaches by His example in the first Lent, His forty days in the desert. in your mouth and in your heart"
Jesus Christ, true God, yes, but at the same true Man, went into the desert armed with the power of His Father through grace by faith, but He had to choose to do so. He teaches us that we must make that same choice if we are to share in His victory over sin and death at the end of the Lent of this life and this world, a desert in comparison with the glory and joy of heaven, our true homeland. Worship here together of the Lord Jesus, who shows us the Father, is our oasis in the desert and our training for the life we lead in the "desert" of daily life with its challenges and difficulties, but also with its hopes and dreams. Faith made strong by worship is the armor we wear into battle for our salvation in Christ. Our intimacy with the Word of God in Scripture makes it possible for the Word to be "near" us, in our mouths for prayer and proclamation and in our hearts by love for Him. "He will command his angels concerning you, to guard you"
How does the temptation of Christ help us? By showing us the way of escape to freedom by means of the grace He guarantees to us. 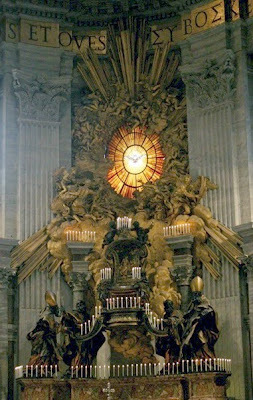 We are given Jesus Christ in our sacramental life, above all in the Eucharist, so that we will be gaurded and guided as He was by grace together with the saints and angels who intercede for us. We are never alone in the desert of temptation for He is with us always, as He promised, even until the end of the world. "bestow your bread on the hungry"
At the heart of the Eucharistic celebration are the bread and wine that, by the words of Christ and the invocation of the Holy Spirit, become Christ's Body and Blood. Faithful to the Lord's command the Church continues to do, in his memory and until his glorious return, what he did on the eve of his Passion: "He took bread. . . ." "He took the cup filled with wine. . . ." The signs of bread and wine become, in a way surpassing understanding, the Body and Blood of Christ; they continue also to signify the goodness of creation. Thus in the Offertory we give thanks to the Creator for bread and wine, fruit of the "work of human hands," but above all as "fruit of the earth" and "of the vine" - gifts of the Creator. The Church sees in the gesture of the king-priest Melchizedek, who "brought out bread and wine," a prefiguring of her own offering. The man of the Old Testament lives his sickness in the presence of God. It is before God that he laments his illness, and it is of God, Master of life and death, that he implores healing. Illness becomes a way to conversion; God's forgiveness initiates the healing. It is the experience of Israel that illness is mysteriously linked to sin and evil, and that faithfulness to God according to his law restores life: "For I am the Lord, your healer." The prophet intuits that suffering can also have a redemptive meaning for the sins of others. Finally Isaiah announces that God will usher in a time for Zion when he will pardon every offense and heal every illness. “The Son of Man must suffer"
Ash Wednesday: "Return to me"
and all the living things that move on the earth. "By its very nature the institution of marriage and married love is ordered to the procreation and education of the offspring and it is in them that it finds its crowning glory." 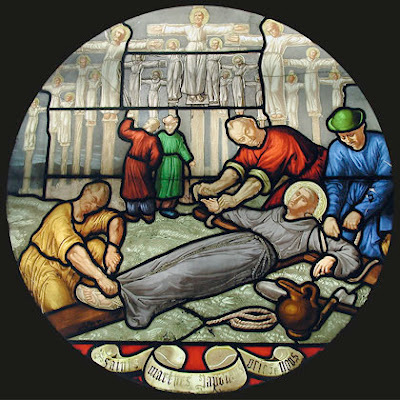 "... you have approached Mount Zion"
S. Paul Miki and companions, martyrs: "Give your servant, therefore, an understanding heart"
... to judge your people and to distinguish right from wrong. All-powerful God, Father of our Lord Jesus Christ,by water and the Holy Spirit you freed your sons and daughters from sin and gave them new life. Send your Holy Spirit upon them to be their helper and guide. Give them the spirit of wisdom and understanding, the spirit of right judgment and courage, the spirit of knowledge and reverence. Fill them with the spirit of wonder and awe in your presence. We ask this through Christ our Lord. 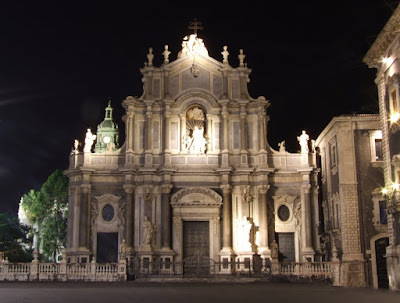 S Agatha: "The king said to the girl, 'Ask me for whatever you wish' "
Photo: Cattedrale di Santa Agata, Catania, Sicilia, Italia. "What more shall I say?" The Law, the sign of God's promise and covenant, ought to have governed the hearts and institutions of that people to whom Abraham's faith gave birth. "If you will obey my voice and keep my covenant, . . . you shall be to me a kingdom of priests and a holy nation." But after David, Israel gave in to the temptation of becoming a kingdom like other nations. The Kingdom, however, the object of the promise made to David, would be the work of the Holy Spirit; it would belong to the poor according to the Spirit.